Home > PLATE CASTERS > Capacity up to 350 lbs: - 3" thru 5" Wheels - Plate Size: 2-3/8" x 3-5/8"
Plate Size: 2-3/8" x 3-5/8"
CasterHQ's Light Duty Caster Series are made with hold up to 350 lbs Capacity depending on the wheel used. 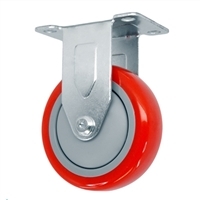 This series of casters is a very versatile and economic caster. These are perfect for lighter duty applications such as Material Handling, Maintenance Carts, Bakeries, Food Service, stocking carts, dollies, and more! These come with the industry standard 2-3/8" x 3-5/8" mounting plate size and are constructed out of heavy gauge cold rolled steel. 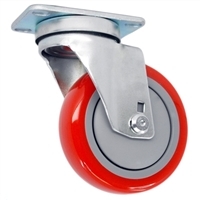 All of our Swivel and Rigid Yokes are Zinc Plated for added rust resistance to give our casters a longer life than our competition and a product you will be proud to have. This series offers many wheel types and materials as well as upgrades including different brake styles and options. Caster HQ's casters and wheels are all NSF Listed and Approved, RoHs Compliant, and ISO:8001 Manufactured for perfect quality control. We stand behind our products and strive to provide the highest quality casters and wheels to provide an extended life as well as a product you will be proud to own.